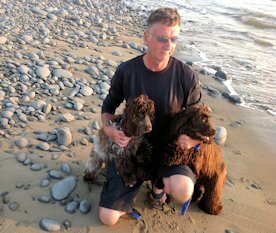 I have kept and bred Cocker Spaniels for over 17 years. I started as a small hobby kennels with Golden Retrievers when I was 18, showing and breeding but now focus on breeding Cocker Spaniels. All my dogs are kept in the house, they come first not me! I've been a Caravaner for many years and the dogs have always come with me. We go down to the caravan most weekends through the summer, having walks on the beach three times a day. The dogs do not have full coats as they are in and out of the water and running through fields when back at home. From April 2016 all dogs must be microchipped as I'm a qualified micro-chipper if you need your dog micro-chipped I can do that and keep him calm at all times I am insured . I also offer a micro-chipping service, please contact me for further information.